There are many options to replace permanently missing tooth among teenagers. One of them is dental implants. As a parent or caregiver, it’s important to really understand how dental implants work and whether they are a suitable option for your teenager. First, remember that the jaw needs to have fully developed in order for the dental implant procedure to be successful. It’s only after the teenager has completed the adolescent stage that the teeth and jaws stop undergoing changes that could impact on the success rate of implant treatment. 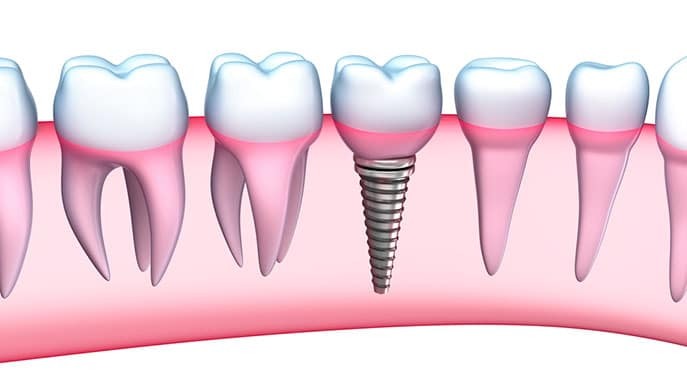 A dental implant, when placed too early on a teenager will not expand and grow together with the jaw as it should. This results in what dental experts commonly refer to as buried teeth. These are teeth that appear too low underneath because the natural teeth have grown around them. Visit an orthodontist with your teenager and have them review his/her current dental health in order to determine if implants are a good fit. When is the right time to have implants? It is important to wait until the jaws and the face have completely grown before going for implant treatment. Only a qualified orthodontist will be able to tell whether the growth phase is complete by doing a few physical exams. Sometimes specialized x-rays will be used to evaluate the patient and determine if the growth of the face and jaws is complete. Orthodontists use other factors to determine if the growth is complete such as physical attributes like an increase in shoe size, to determine if the patient has finished growing. Bear in mind that no one can determine exactly if someone has completed growth. If you have a teenager and an orthodontist doesn’t recommend implants as a tooth replacement option, there are other alternatives that you may consider for him/her. For instance, you may look into tooth replacement procedures that are temporary and will only last for a few years. A good example is the bonded dental bridges which can work really well and are very comfortable to wear. The fixed or bonded bridges will not affect the adjacent teeth. However, discuss the complications associated with them. The dental treatment that is most suitable for a teenager will depend on the oral situation. For instance, dental bridges and dentures may not be a suitable choice since they normally have very active lifestyles and the discomfort can really impact on their quality of life. Think of dental procedures that will help to replace the missing teeth and at the same time not expose the rest of the healthy teeth to any form of damage. Consult a qualified dental technician who is well versed in tooth replacement options for teenagers. Your family dentist should provide the best advice on how to go about the situation. Most importantly, make sure the teenager continues to practice good oral hygiene because it will impact on the success rate of the implant treatment when the time comes.